Group fitness instructors are skilled educators, entertainers and motivators, who inspire people to engage in healthy lifestyle choices. Their classes flow from one movement to the next, and their exercises are always on beat and on phrase with the music. Teaching an effective fitness class requires careful planning and strategy. 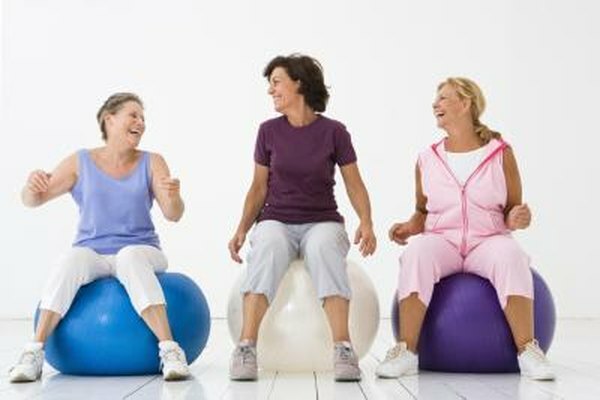 People of all ages and ability levels may take a group exercise class, but certain types of people tend to visit the gym at specific times of the day. Knowing the predominant population will help you determine the appropriate exercises and music. If possible, take a class held within the same time frame to get a sense of the class population. Most fitness centers want classes to start and end precisely on time, so rehearse and time the class before teaching it to your students. If your class plan extends beyond the time allotted, check your transitions. A series of walking lunges functions as an aerobic cool down and a lower body muscle toning segment. Add time-efficiency by having a new exercise begin where the previous one finished. Sequencing a side leg raise series with a side plank, a supine abdominal series with a supine bridge and a push-up series with a prone or all-fours gluteal workout will save a considerable amount of time. Introduce yourself to your class before you begin. Be friendly but not overly chatty. Ask about any injuries, pregnancies or other health concerns, and be prepared to make modifications for these students. Most fitness centers have a mirror in the front of the room. Instructors either face the mirror and watch their student's reflections or they face their class. The latter, while more personal, is challenging for the instructor, because she must remember that her right is their left. Skilled instructors change their position throughout the class. Advise students to follow some of the front-row members, who are often thrilled to be placed in a semi-leadership role. Always begin with the simplest version of a movement or exercise, and then gradually add complexity and intensity as an option. This allows beginners to remain at their comfort level, while advanced participants get the appropriate challenge. When aerobic movements require arm and leg movements, begin with the leg movements, and then add the arms as an option. Fitness music is arranged in 32-count phrases in 4/4 time. Instructors, especially aerobic instructors, need to be able to stay on beat and on phrase. The instructor can be on the beat, but if the movements do not start at the top of the musical phrase, something will feel off about the movements. This applies to aerobics and resistance training exercises. Using sets of eight to 16 repetitions for resistance training keeps you on phrase with the music. Different types of workouts require different beats per minute. Most gyms have a pitch control that lets you adjust the music speed. Watch your students and slow down the music if they are not moving through the full range of motion. Cuing is one of the most challenging aspects of teaching group fitness. The term "descriptive cuing" is a derogatory phrase that aerobic directors use to describe instructors who cue movements at the moment that they are about to happen. Your students require prior warning, so cue your next move at least four beats before the transition. Counting backward, especially during resistance exercise, alerts your students that they are coming to the end of an exercise, so they should be ready for new instructions. For a 16-repetition exercise, count forward for repetitions one through eight, and backward for repetitions eight through 16.